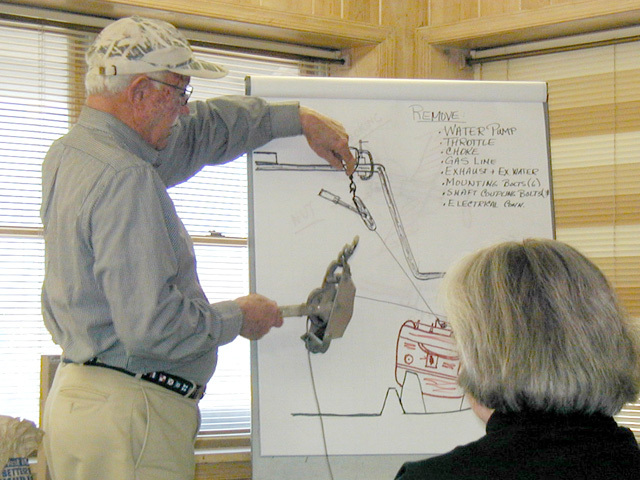 At the February 2002 maintenance seminar, Towney described the techniques he uses to remove and replace the engine. 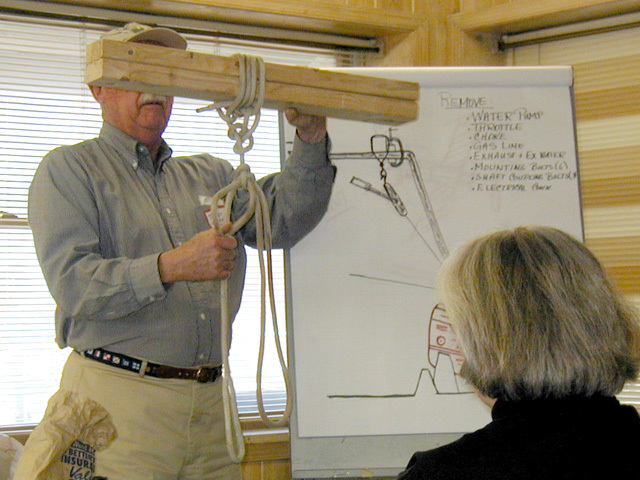 After removing all the connections to the engine, he constructs a beam across the companionway with a couple of two-by-fours. To keep this from sliding, he fixes some blocks of wood with C-clamps on the aft side. For reinstalling the engine, Towney works in reverse. Because the new boats use bolts that thread into buried nuts for the engine mounts, Towney created some guide pins from spare bolts. He cut off the heads of these bolts and then cut screwdriver slots in the top. These are screwed down into the mounting points and the rubber pieces (cut from tire sidewalls) and shims are placed on top. The engine is lowered down on these temporary pins. Once everything is in place, the pins can be unscrewed and the original bolts replaced. 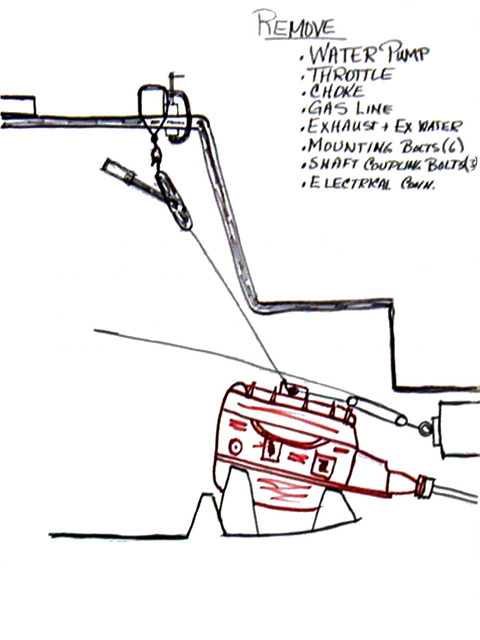 To jockey the engine around for shaft alignment, Towney recommended a "chinese jack." This consists of a basketball, deflated until it fits under the engine. 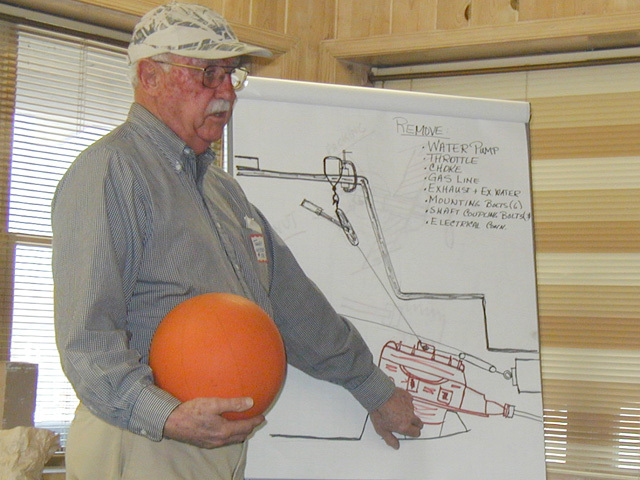 Then, to move the engine slightly, the basketball is inflated until the engine lifts just enough. This allows the engine to be moved around and for the shims under the engine mounts to be adjusted.